These prices are just an idea for a starting point. All final prices are based on intricacy of design. All orders require a 50% non-refundable deposit to secure the date of your event. All orders require a minimum one month notice unless otherwise specified. Delivery is available for all our products and is determined by location and services needed (will we set up for you). Delivery prices start at $25. Pricing of cakes will incorporate the answers to the above questions, intricacy of design, as well as any special tools/equipment that must be sourced to produce the desired products. Cake toppers are priced separately. All cakes should be ordered at least one month in advance. Three to four months in advance is recommended for weddings, anniversaries, or large, elaborate parties. Rush orders will be accepted if there is availability but will be charged a rush fee. 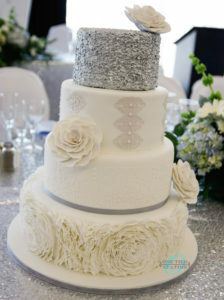 Cakes decorated with fondant start at $7.00/serving. Chocolate ganache is available instead of buttercream, please email for price. Cake stand available for rental of $25. Individual mini cakes start at $15/each. Several months notice are needed for these. Standard cupcakes (with buttercream swirl) are $3.50/each. Fondant covered cupcakes start at $5.00/each. Fondant toppers, packaging, ribbons, and tags are priced separately. Cupcake stand available for rental of $25. Priced by cupcake plus design cost. Sugar cookies decorated with royal icing begin at $4.00/each for a simple design, one color design. Plain chocolate covered Oreos with a chocolate drizzle are $3.00/each. More intricate designs are priced accordingly. Packaging, ribbon and tag are priced separately. Chocolate dipped pretzels with a secondary drizzle color are priced at $2.00/each. Chocolate dipped rice krispie treats with chocolate drizzle design are $3.00/each. Fondant accents available and will be priced according to intricacy. At this time, we do not offer cake pops or macarons. Dessert tables are priced according to dessert ordered, intricacy of design, setup and delivery charges, as well as any platter, container, cake or cupcake stand rentals. Please send us an email for a quote. Cupcakes toppers made of paper on a toothpick start at $0.75/each. Standard gift card holders start at $1.50/each. Please send us an email and we will work with you to decide what sort of party décor you desire and work within your price range. These small gifts that are perfect for handing out in the classroom as a token of friendship start at $1.50/each. If there is anything you are looking for that is not here, please feel free to email us. We are always looking for suggestions and can custom design whatever you need.